White House backing could ease approval for Oregon’s Jordan Cove terminal. This April, President Donald Trump’s chief economic adviser gave a major endorsement for developing and exporting more natural gas across the Western U.S. During a D.C. policy talk, National Economic Council Director Gary Cohn said the U.S. should be the world’s leader in exporting natural gas, and even shared the administration’s strategy for getting there. “The first thing we’re going to do is we’re going to permit an LNG export facility in the Northwest,” said Cohn, referring to a liquified natural gas port, where gas is chilled and liquefied for easier and cheaper storage and transport, including to customers overseas. Cohn clearly meant the Jordan Cove Energy Project, which was denied a permit by the Federal Energy Regulatory Commission under the Obama administration in 2016. The $7.5 billion project, backed by the Calgary-based company Veresen, Inc., would include the Pacific Coast’s first LNG export terminal at Coos Bay, Oregon. The terminal would give Western producers access to the world’s largest gas market, consisting of Japan, the biggest consumer, South Korea, Taiwan and other Asia-Pacific countries. The 235-mile Pacific Connector pipeline is also part of the project. It would cross Oregon and provide a critical link between the export terminal and the rest of the West’s pipeline network, which stretches into gas-rich basins in Colorado, Utah and Wyoming. 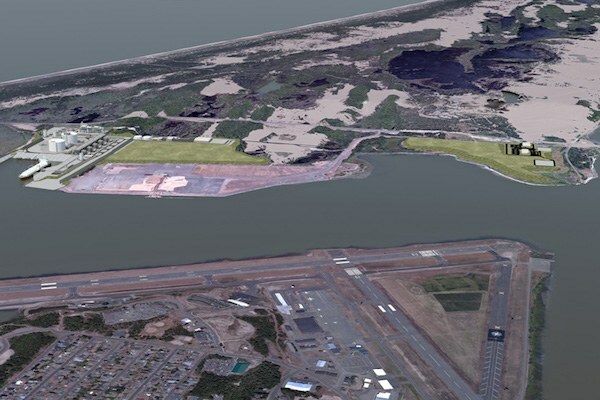 An artist’s conception of the proposed Jordan Cove liquid natural gas terminal in Oregon. The project already has an Energy Department permit, but future terminals may be automatically approved if the Trans-Pacific Partnership goes through. If FERC commissioners green-light Jordan Cove, it could set off a massive new drilling boom on public lands within Colorado’s Piceance Basin, Wyoming’s Jonah Field and Utah’s Uintah Basin. Industry is already nominating more leases for drilling on public lands under Trump. “There seems to be an alignment of momentum around ramping up fracking in western Colorado,” says Jeremy Nichols, of WildEarth Guardians. To win approval for the project, Veresen and its Oregon supporters, who see the project as a local job creator, have forged a powerful alliance with Rocky Mountain states eager to enter the export market. State government and industry officials from Colorado and Wyoming have even traveled to Asia to woo potential investors and customers. Still, even under Trump, the project isn’t a sure bet. Stagnating gas prices, caused by a supply glut in recent years, raise questions about the viability of Jordan Cove. Currently, there’s only one LNG export terminal in the Lower 48, on Louisiana’s Gulf Coast. FERC, which regulates interstate energy transmission and transportation, has approved another 11 ports in the Gulf, Maryland and Georgia—but none so far on the West Coast. FERC first considered Jordan Cove in 2007. Back then, it was proposed as an import project, which would have funneled gas from Russia or the Middle East to consumers on the West Coast. FERC issued a permit in 2009, but vacated the decision in 2012 as import prospects sank. Then, the meltdown at Japan’s Fukushima power plant created a different opportunity. After the disaster, Japan and other Asia Pacific countries began phasing out nuclear power and replacing it mostly with LNG. In 2013, a Veresen subsidiary resubmitted an application to FERC which re-envisioned Jordan Cove as an export terminal that could ship 1 billion cubic feet of gas a day. That’s enough to meet 8 percent of Japan’s current demand. Around the same time, industry and government leaders in Colorado, Wyoming and Utah started exploring opportunities in foreign markets. Wyoming Gov. Matt Mead and other state officials visited South Korea, Taiwan, Japan and India to build the case for new coal export terminals, as well as for Jordan Cove. An LNG terminal could be critical for gas producers in the state, says Brian Jeffries, executive director of the Wyoming Pipeline Authority, a state board that promotes energy development. The state’s domestic sales have dwindled in recent years due to the uptick in drilling and hydraulic fracturing nationwide. An Asia-Pacific export market could offset those losses. Congressional representatives from both parties in all three states have expressed support for the project, and a 2014 report commissioned by a Western Colorado economic-development group, further stoked enthusiasm. It suggested that the Piceance Basin was an overlooked source of gas for Asia. The region’s steady production and the underused Ruby Pipeline, which runs from southwest Wyoming to eastern Oregon, meant there was supply and shipping capacity in existing infrastructure. Yet there was no way to get gas all the way to the coast. 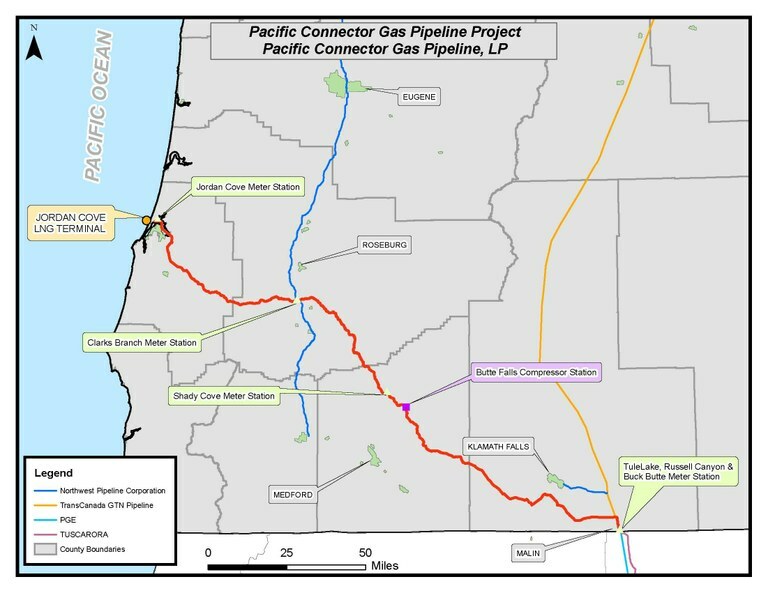 to get natural gas from the Ruby Pipeline to the proposed Jordan Cove terminal, proponents also hope to build the Pacific Connector pipeline (the red line in the map), which crosses timber country in southern Oregon. Oregon Department of Environmental Quality. Colorado Gov. John Hickenlooper took a copy of the economic report on a 2015 trade mission trip to Japan to plug the state’s energy capabilities. Then came a 2016 U.S. Geological Survey study, which estimated that the Piceance Basin’s Mancos shale formation contained an astronomical 66 trillion cubic feet of recoverable natural gas. That’s more than 40 times a previous estimate, and enough to supply the entire U.S. for two-and-a-half years. Those are good talking points, but an increase in global gas production has dropped prices, says Akos Losz, senior research analyst at the Columbia University Center on Global Energy Policy. That is bad news for Jordan Cove, even with the advantage of its relative proximity to Japan and Asia because its construction costs are steep compared to other export terminals. FERC released its environmental review of Jordan Cove in September 2015, and proponents considered it to be favorable. But the commission rejected the project in March 2016, finding “little or no evidence of need” for the connector pipeline and thus no need to build the export terminal either. In Oregon, environmentalists and landowners along the pipeline route strongly opposed it, since construction would require seizing private lands and clearing a 50-foot-wide corridor, while also contributing to more climate-changing fossil fuel development. The commission also cited the costs to landowners, who could be stripped of property through eminent domain. Veresen and its Rocky Mountain allies hastily called for a rehearing, citing new pledges of support. Just weeks after the denial, Veresen announced preliminary agreements with a major Japanese utility alliance and a large corporation that would together buy half of the gas exported through the terminal for the project’s first 20 years. These deals were meant to show there were customers eager to buy its gas, and that there was in fact a need for the project. FERC rejected the rehearing request in December of last year. But that now looks like a temporary setback, as Trump’s team hawks LNG exports. Veresen filed a new pre-application with FERC this spring, and included commitments from 100 of the 265 impacted landowners to accommodate the pipeline, plus letters of intent from the Japanese customers. Trump also recently nominated three new FERC commissioners, who could rule on the new application this year. “It bodes well for the project,” Ludlam says of administration support, adding investments are already picking up in Piceance Basin. Losz, however, cautions that political zeal alone won’t get gas flowing across the Pacific. Should FERC permit Jordan Cove, opponents could challenge the approval in court as a political decision, rather than a sound regulatory one, based on Cohn’s telegraphed statements. Further, the Asian market is likely to remain saturated with cheap gas through 2023, Losz says. And the commitments from Japanese buyers are not guarantees, and probably not enough to justify building the project at current prices. “For Jordan Cove, the (financial) reality could be hard to overcome,” Losz says. Joshua Zaffos is an HCN correspondent reporting from Fort Collins, Colorado.